Fall is here and with changing seasons comes changing self care routines. I couldn’t be happier with signing up for Winc – as it reminds me of old memories and will definitely help make new ones. It turns out, I used to be a Winc member when it was Club W and it’s actually a pretty cute story. Back in 2014 when I was living in New York City and working in the fashion industry, I joined Club W as a way to treat myself, discover new wines, and get them delivered right to my door. Wine delivery, anyone? Around the same time, I started dating my now-husband (whom I worked with) and every time my monthly box was delivered to the office I would text him so we could set up a night to drink wine and make dinner. Okay, or order takeout. We usually ordered takeout. Sometimes we’d end up drinking the entire three bottles in one night because we were in our mid-twenties and you could do that and still be a semi-functioning human the next day. The wine was always delicious and interesting, plus it was so fun to learn about something together! There were a few months I even added an extra order because that meant I got more wine and more time with Corbin. I’ve now returned to the unique wine club for several reasons, but most importantly because I love relaxing with a glass of wine. To me, getting cozy on the couch with a glass of wine is a nice way to create more peace in your home and daily life, and Winc’s wine delivery and monthly wine club make it easy. Please drink responsibly. Winc is a wine-delivery service that drops off custom-curated wines right to your door each month. It’s been dubbed The Netflix of Wine because you can choose exactly what kind of wine you want or even have Winc suggest wines you’d enjoy based on your preferences. You’ll receive four wines per month (or more, if you’d like!) at a discounted price straight from Winc. What’s different about Winc is that they produce all of their own wines by partnering with exclusive and independent wineries around the globe. That means, a better wine and a better price for you! From Winc: Winc believes that the experience of getting a great bottle of wine should be as simple as enjoying one. Our team creates and curates over a hundred wines, and makes the experience of exploring wine easy and pleasurable—so you can spend more time enjoying the wine in your glass. HOW MUCH DOES WINC COST? Let’s just say, it’s pretty darn affordable. I managed to keep my wine subscription active while living in New York City and felt that it didn’t break the bank. Honestly, it felt a lot cheaper than buying less-quality wine at the local bodega. Today, I’m still a Winc member and am excited about trying out new, high-quality wines, especially since I saved $20 off my first Winc order. With Winc, all wine bottles start at just $13 and you will receive four bottles in your monthly delivery. 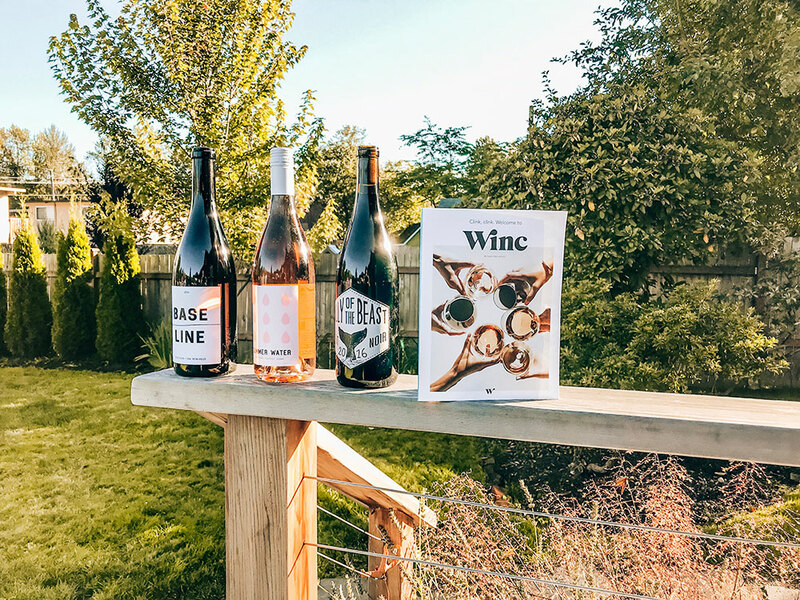 When you become a Winc monthly wine club member, you will receive free shipping and as an extra perk, there are no membership fees associated with your monthly membership. Also, you can skip a month or cancel at any time, hassle free. Also, all of the wines I’ve tried are so good and even if you’re not a huge fan, Winc has a 100% satisfaction guarantee return policy. The best part? You can get four bottles of wine for as low as $26 when you save $20 off your first order. Um, that’s a no-brainer to me. For my first order, I picked three wines – Baseline Pinot Noir ($42), Summer Water Rosé ($18), and Folly of the Beast Pinor Noir ($18). My total before any discounts was $78, but with free shipping and $20 off, the total was just $62.99. Considering the bottle of Baseline was original $42 on its own (my husband picked this out…), I’d say it’s a great deal! Also, you decided how many wine bottles you want to include in your order. The minimum is 3, but you can certainly add more if you want! Is there any better feeling than getting wine delivered to your door? Not really, my friend. Not really. I was so excited to open up my first delivery from Winc and climb into a hot bath. I’ve been traveling a lot, so this has been a favorite way for me to unwind, especially as it starts to get cooler outside. It’s important to mention that someone over the age of 21 must be at home to sign for your Winc wine delivery. Kind of a pain, but totally worth it. When I was living in NYC, I would just ship it to my office to have the front desk sign for me. Now that I work from home, it’s no problem, especially because Winc texts me with optional delivery updates. Upon opening your Winc box, you’ll find a super helpful booklet that’s packed with information all about Winc’s wines and wine in general. It’s very easy to digest and is fun to browse through and read about your new wines. I really loved the ‘A-Z of Wine’ section! This easy-to-drink pinot is described as round with bright fruit. It’s also vegan and a crowd-pleaser! It’s described as easy to drink and vibrant. It’s also eco-friendly, vegan, and deliciously crisp. The fanciest of the three, this is elegant, barrel-aged, and quite complex. It’s also eco-friendly! All of the three wines I tried from Winc were delightful and exactly as described online and in the booklet I received with my first order. I felt like I was having a sophisticated wine experience – complete with suggested pairings – all in the comfort of my own home. Honestly, Winc is a total winner in my book. Ready to save some money on your monthly wine delivery? You can save $20 on your first Winc order by simply clicking the button below! The discount will be reflected in your shopping cart. SAVE $20 AND ORDER WINC NOW! Winc has been such a fun way to try new wines and learn more about them through their monthly wine delivery service. I love it because you get to pick the wines you want each month so you truly get to try a wide range of wine at a great price. I hope you love your experience with Winc as much as I do! And don’t forget that you can save $20 on your first order. Woo! Okay, I wouldn’t be a responsible self care coach if I didn’t mention self care vs. self indulgence. I totally agree that unwinding after a long day with a glass of wine is a nice way to make room for yourself and create a few moments for you. It’s important to note there is a distinct difference between consciously creating space and downing an entire bottle all in the name of “self care”. ARE YOU EXCITED TO TRY WINC? HAVE ANY QUESTIONS? Tell me in the comments section below!